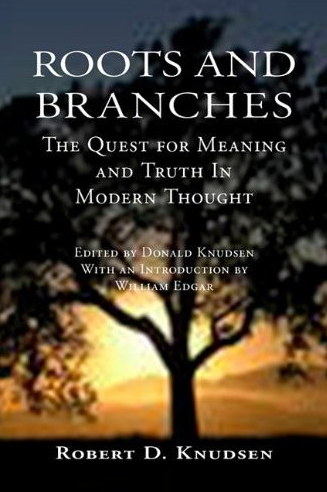 Roots and Branches: The Quest For Meaning And Truth In Modern Thought. Reformational Publishing Project/ Paiedia Press, 2009. Reformational Publishing Project/ Paiedia Press are leading the way in getting reformational books into readers' hands at a great price. This is book comprises a series of articles by Robert Knudsen compiled by his son Donald. it also has an appreciative introduction from William Edgar. The range and scope of the articles are testimony of Knudsen's wide areas of interest. Knudsen studied under Cornelius van Til and S. U. Zuidema. From 1958 he taught at Westminster theological Seminary where he taught apologetics and courses on Dooyeweerd's philosophy (for an outline of the syllabus see here), His main area of expertise was on existential theology (his Masters was on Tillich, Niehbuhr and Berdyaev). All three of these areas are reflected in this compilation. "Calvinism as a Cultural Force," in John Calvin: His Influence in the Western World. W. Stanford Reid, editor. Grand Rapids: Zondervan, 1982, 13-29. "Apologetics and History," in Life Is Religion. Henry Vander Groot, editor. St. Catherines: Paideia Press, 1981, 119-133. "Roots of the New Theology," in Scripture and Confession. John Ski1ton, editor. Philadelphia: Presbyterian & Reformed, 1973, 247-273. "Analysis of Theological Concepts: A Methodological Sketch," in Westminster Theological Journal. 40, Spring, 1978, 229-244. "May We Use the Term Theonomy?" in Theonomy: A Reformed Critique. William S. Barker & W. Robert Godfrey, editors. Grand Rapids: Zondervan, 1990, 15-37. "The Transcendental Perspective of Westminster's Apologetic," in Westminster Theological Journal. 48, Fall, 1986, 223-239. "Progressive and Regressive Tendencies in Christian Apologetics," in Jerusalem and Athens. Robert Geehan, editor. Philadelphia: Presbyterian & Reformed, 1971, 275-298. "Crosscurrents," in Westminster Theological Journal. 35, Spring, 1973, 303-314. "Symbol and Reality in Nicolas Berdyaev," in Westminster Theological Journal. 24, November, 1961, 38-47. "The Ambiguity of Human Autonomy and Freedom in the Thought of Paul Tillich," 4-part series in Philosophia Reformata. 32 (1967) 55-67, 33 (1968) 32-44, 34 (1969) 38-51, 37 (1972) 3-25. "Transcendental Motives in Karl Jaspers' Philosophy," in Philosophia Reformata. 34 (1969) 122-133. "Rudolf Bultmann," in Creative Minds in Contemporary Theology. Philip E. Hughes, editor. Grand Rapids: Eerdmans, 1966, 131-162. "Transcendental Method in Dooyeweerd," in Anakainosis. 1/3, April, 1979, 2-8. "The Religious Foundation of Dooyeweerd's Transcendental Method," in Contemporary Reflections on the Philosophy of Herman Dooyeweerd. D.F.M. Strauss and Michelle Botting, editors. Lewiston, Queenston, Lampter: Edwin Mellen Press, 2000, 271-285. "Dooyeweerd's Philosophical Method," mimeographed lecture delivered at Annual Philosophy Conference, Wheaton College, Wheaton, IL, Oct. 13, 1962. "Phiiosophia Reformanda: The Idea of Christian Scientific Endeavor in the Thought of Herman Dooyeweerd," in Reflections on the Philosophy of Herman Dooyeweerd. Mimeographed text, Westminster Theological Seminary, 1968. Bibliography Of The Writings Of Robert D. Knudsen, in Westminster Theological Journal. 58, Spring, 1996, 111-121. Dr. Knudsen was a great encouragement to me in my early years of Dooyeweerd interest. My http://reformatorische.blogspot.com/ is dedicated to his memory. I'm reading Roots&Branches now. Really benefiting from and enjoying it.